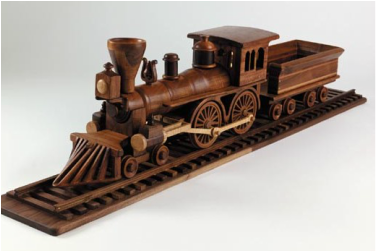 Baldwin Toys is a family-operated company that handcrafts wooden toys with quality reminiscent of yesteryear. Made in the USA since 1976, our toys have been displayed at prominent arts and crafts shows, featured in publications and have received numerous awards. They have also been shown in Mannheim Steamroller's Christmas video “The Little Drummer Boy”. The premise upon which we create our toys is simple. We want our toys to lighten and bring joy to children and adults of all ages, and to last generations to come! Our toys are sure to become your keepsake heirlooms. Wood for the different parts is carefully selected from rough lumber such as walnut, cherry, maple, rosewood, and padauk. The woods and their rich grain patterns give each wooden toy it's own personal quality. No two models are exactly alike. 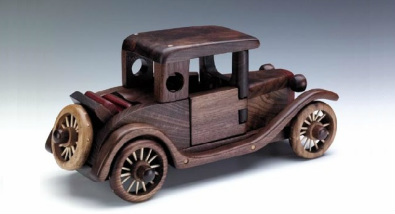 Hours of painstaking care are given each wooden toy as it progresses from initial design to precise fitting and shaping to hand sanding and finally to lustrous oiling and waxing. Please check out our Facebook and You Tube pages by simply clicking the links below!